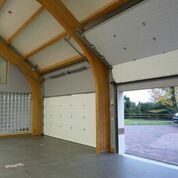 The ThermAdor range is supplied with a choice of Kingspan residential track systems making it ideal for most garages. 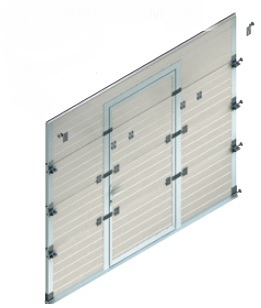 For maximum flexibility, our extensive hardware range covers all sizes of openings up to 5500mm wide x 3000mm high. All our track systems are fully CE marked. 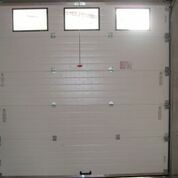 Kingspan offer different track systems for ThermAdor so that the door may be installed in all types of garage. Kingspan’s standard headroom track system requires 200mm headroom clearance for both a manually operated and an automatic door. Sideroom clearance required is only 75mm. The springs are installed above the door opening. Kingspan’s low headroom track system requires only 70mm headroom clearance for a manually operated door and 100mm headroom clearance for an automatic door. Sideroom clearance required is only 75mm. The springs are installed on the back brace at the rear of opening. 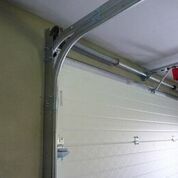 Ideal for small doors or for garages with very little headroom or sideroom, Kingspan’s extension spring system operates with only 40mm headroom clearance for a manually operated door and 70mm headroom clearance for an automatic door. Sideroom clearance required is only 50mm. The springs are installed at the side of the opening. ThermAdor Residential may also be supplied with High Lift, Vertical Lift and Follow-the-Roof industrial hardware on special request. 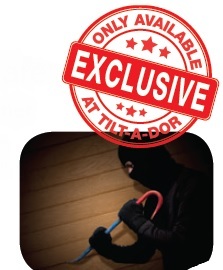 For larger sizes please refer to our ThermAdor Industrial sectional door range. 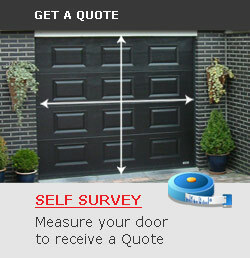 Kingspan’s EasyPass Door, allows safe and secure access without having to open the whole garage door. Built into your garage door, an EasyPass door offers a convenient way of entering the garage without the need to open the whole garage door. Please visit our Features and Benefits page for more information. For the security conscious homeowner The SKG security upgrade is a unique hardware modification to our ThermAdor 200 and ThermAdor 70 track systems. 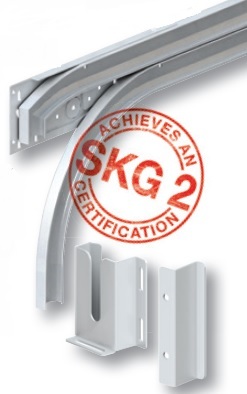 In addition to the standard security features of the ThermAdor range, the SKG security upgrade lends even greater protection to prevent forced entry and meets the European SKG 2 certification standards for burglar resistance. Angled top curve to prevent your door being levered up and around the track. Intermediate track plates to prevent your door being prised in at the midpoint section. Base track anchors lock the bottom wheels in position to prevent them being forced out of the tracks. Our specialists are pleased to answer technical queries regarding the use of our products from the specification stage right through to installation. We can even liaise directly with your architect. Our customer services department provides a professional, friendly and efficient service. We’re always happy to help. It’s important to have peace of mind when you invest in a new garage door and that’s why the ThermAdor range comes with a limited 10 year warranty.